Join the discussion on our forums! Come discuss Grimscale Chum over in our dedicated Grimscale Chum discussion topic. Why is his Attack sound "Bulbasaur"? It seems more "PRAISE THE SUN!" ok its official i'm already sick of these buff hand cards. Huh, apparently adding a mustache to a murloc is a bad idea. 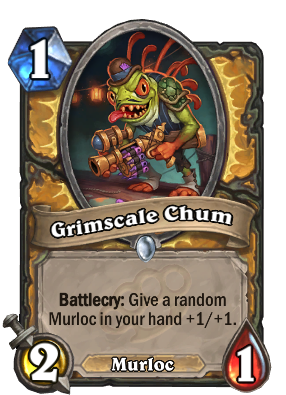 Now if only this card gave a random murloc in your hand a mustache, I think the card would single-handedly make murloc decks top tier. Now that would be just amazing!! Buff isn't bad, and not bad stats for 1 drop. Do you really wanna ruin Anyfin Can Happen combo for just +1/+1 only playing from hand? Finja is a crazy buff though. I miss old murk eye in standart even more now. Fits perfectly in the current murloc Paladin, nothing can ever go wrong if you put this card in that deck. Nay I say, you put this bae into a new murloc deck, kay? Oh god, Murlocs eating their babies? WTF? We have seen that there is still no a Warlock or Shaman Cards are revealed so I think Shaman Cards will be Murlocs or Totem Cards and Warlock Discard and some Demons Cards. This should buff all Murlocs in hand. I don't think it's any better than that other 2 mana 1/1 that buffs all in hand for 1/1 .-. So many murlocs, only 30 card slots in a deck. Difficult descisions.